Meet Greg Swirson, our July 2018 #DryTortugas Photo Contest winner. We had the chance to ask him a few questions about his experience at the Dry Tortugas National Park. Read on to learn how he captured his amazing photo! We visited the Dry Tortugas National Park the last week in April and took the Yankee Freedom. The ferry trip was relaxing smooth. My girlfriend and I were walking around the most towards the north pier to watch the sunset. I caught a shot of her silhouetted with the sky lit up orange and reflecting on the water in the most. I was using my Nikon D5300 and a 70-150mm lens. 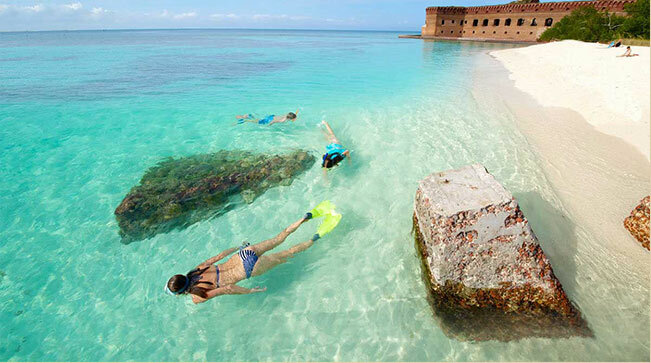 The whole experience at Dry Tortugas was memorable. The wildlife alone was incredible. Watching the birds around the island and snorkeling were definite highlights. The night sky was so clear it made camping its own unique experience. My goal is to visit every National Park, the Dry Tortugas was actually my 43rd. Next I would love to visit the Hawaiian national parks and hopefully the American Samoa’s.